Narendra Jadhav, an IU alumnus, economist, writer and educator and a member of India's parliament, will present the sixth annual Patrick O'Meara International Lecture at Indiana University Bloomington. His lecture, "India and the United States: Caste, Race and Economic Growth," will take place at 4 p.m. Nov. 14 in Presidents Hall in Franklin Hall, 601 E. Kirkwood Ave. The lecture, presented by the Office of the Vice President for International Affairs, is free and open to the public. No tickets or advance registration is needed. A reception will follow. The lecture also will be streamed live at broadcast.iu.edu, where archived video also will be available later. Jadhav, who earned a doctorate in economics from IU in 1986, served the Reserve Bank of India for 31 years, retiring in 2008 from the position of principal advisor and chief economist. From 2006 to 2009, he was vice chancellor of the University of Pune, the largest traditional university in the world with 650,000 students. He also worked for four years at the International Monetary Fund. A prolific writer with 100 research papers and more than three dozen books in English, Marathi and Hindi, he served from 2009 to 2014 as a member of the National Planning Commission, chaired by Prime Minister Manmohan Singh, and a member of the National Advisory Council. He serves in the Rajya Sabha, the upper house of India's parliament. In 2011, McRobbie presented Jadhav with its Thomas Hart Benton Medallion, which is given to individuals who have achieved a level of distinction in public office or service and have exemplified the values of IU. Last month, he met with IU Bloomington Provost and Executive Vice President Lauren Robel during her visit to India on behalf of the university. Jadhav is known to millions of Indians, particularly many of its 165 million Dalits, for his 2003 book "Outcaste -- Life and Triumphs of an Untouchable Family in India" and a follow-up book in 2005, "Untouchables: My Family's Triumphant Journey Out of the Caste System in Modern India." "Outcaste" was an expanded and rewritten English version of Jadhav's book in the Marathi language, "Amcha Baap Aan Amhi (Our Father and Us)," published 10 years earlier. Both books are based on family stories and diaries written by his father. It concludes with an epilogue contributed by his then 16-year-old daughter, Apoorva, who was born in Indiana. "Untouchables: My Family's Triumphant Journey Out of the Caste System in Modern India" was published by Simon & Schuster in 2005 and has been translated into 15 languages. An authority on B.R. Ambedkar, Jadhav has written 21 books about the social reformer and architect of the Indian constitution. He also has published a trilogy on Bengali poet, writer and artist Rabindranath Tagore and several books on economics and monetary policy. 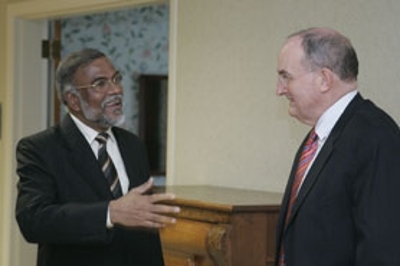 In addition to presenting the O'Meara Lecture, Jadhav will participate in a series of activities with faculty and students at the IU School of Global and International Studies, the College of Arts and Sciences, the Kelley School of Business and the Hutton Honors College over a three-day visit to campus. The O’Meara Lecture was established in 2011 to honor Patrick O’Meara, IU vice president emeritus of international affairs. It brings to the IU Bloomington campus distinguished speakers who address critical topics in international affairs. For more than four decades, O’Meara served as IU’s ambassador to the world. A faculty member in the Department of Political Science in the College of Arts and Sciences and the School of Public and Environmental Affairs, he directed IU’s African Studies Program, was dean of international programs and was IU’s first vice president for international affairs. For decades, IU has been a leader in international studies, teaching more foreign languages than almost any other American institution of higher education. Today, it is home to area studies centers for every continent of the world other than Antarctica. Last year, classes began in a new building serving as the home of the interdisciplinary School of Global and International Studies. For more information about the lecture, contact the IU Office of the Vice President for International Affairs at ovpia@iu.edu or 812-855-5021.